What do You Think are the Symptoms of Nicotine Withdrawal? Currently, Prevalent symptoms of Nicotine withdrawal are cravings for nicotine, anger/irritability, anxiety, depression, impatience, trouble sleeping, restlessness, hunger or weight gain, and difficulty concentrating. [Introduction to Pharmacology Third Edition]. How Is Nicotine Withdrawal Treated? or decrease in intake of nicotine. According to Medline plus in a reviewed article on”Nicotine and Tobacco” nicotine withdrawal is the effect that nicotine-dependent individuals experience after they discontinue or decrease nicotine use. Drug dependence period. Tobacco and nicotine can be extremely addictive like alcohol, cocaine, and morphine. (typical examples of hard drugs). 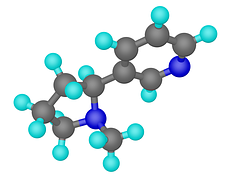 Nicotine is an active chemical substance in tobacco plant. It constitutes approximately 0.6–3.0% of the dry weight of tobacco [Smoking and tobacco control monograph, 2012). Most research scientists believes nicotine is an anti-herbivore chemical. Consequently, nicotine was widely used as an insecticide in the past [Rodgman, Alan; Perfetti, Thomas A. (2009). In smaller doses (an average cigarette has a percentage yield of bout 2 mg of absorbed nicotine), the chemical substance acts as a stimulant in mammals, while high concentration (50–100 mg) can be harmful. [ Nicotine (PIM), 2012]. Nicotine can be as addictive as other drugs, including alcohol, cocaine, and morphine.This phenomenon is drug abuse. In rare situations, nicotine can have positive effects on the brain, tobacco also contains more than 20 cancer-causing chemicals (carcinogens). These harmful toxins can result in the complete metamorphosis and growth of smoking-related diseases such as lung cancer, heart disease, and stroke. In an effort to prevent these diseases, millions of smokers attempt to quit each year. Smoking cessation is often made more difficult by nicotine withdrawal. The symptoms of nicotine withdrawal can begin within 40 minutes after your last use of tobacco. The noticeable Symptoms will depend on your level of addiction. Factors such as how long you have used tobacco and how much tobacco you use on a daily basis will impact the severity of your symptoms. Symptoms of nicotine withdrawal can include but not limited to what was given above. Symptoms of nicotine withdrawal typically peak within two to three days. The symptoms often go away by two weeks. Some people may experience nicotine withdrawal for several months (NCBI, 2011). Never try to quit nicotine intake alone or by self medication.If you decide to quit smoking, contact your doctor to discuss ways to manage your withdrawal symptoms. Your Medical expert or doctor may be able to provide you with access to prescription medication or information about support groups in your community or city. 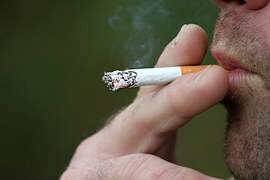 Numerous treatment methodologies are available for nicotine withdrawal.Over-the-counter supplements including gum and skin patches, or prescription nicotine replacement methods such as inhalers and nasal sprays can to sa reasonable extent reduce symptoms by slowly decreasing the mole or amount of nicotine in your body. Treatment can tentatively also include the use of non-nicotine prescription medications such as Chantix. If you are trying to quit smoking, you may also benefit from the help of others who are trying to quit. Joining a smoking quitting program or a support group may increase your chances of success. Nicotine withdrawal is not a life-threatening predicament. Nonetheless, you may notice some physical or mood changes once you finally quit smoking. Some people gain weight as a result of quitting smoking. If you have concerns about this issue, always try to seek for medical advice from your doctor. He or she may be able to help you identify strategies to manage your weight. Some people may also experience mental health issues. Patients that have had episodes of depression in the past may experience a relapse. This may also occur for people that have had bipolar disorder or other substance abuse problems in the past. Depression associated with nicotine withdrawal is often temporary and subsides with time. Depression is a treatable condition, but it can be life-threatening if it is left untreated. If you have a history of depression, talk to your doctor about ways to manage your symptoms during smoking cessation. Long-Term Optimism for Patients that Develop Nicotine Withdrawal? Nicotine Withdrawal can be unpleasant so it is very important and somewhat useful to think of the symptoms as signs that your body is recuperating from smoking. Some people only have a few mild symptoms but others have more extreme and severe symptoms that are more problematic to deal with. Majority of the addicts tends to discover the disappearance of the symptoms within two to four weeks (though for some people they may last longer). Symptoms tend to rise and fall over several weeks, in some cases a month. Remember, it all passes if you hang on and stay quit. Nicotine replacement products and quitting medication can reduce most withdrawal symptoms. Overcoming nicotine withdrawal is often the most difficult part of quitting smoking. Many people tend to give it their best short for more than once in order to successfully quit. The more you try to quit, the more likely you will be to succeed. I oblige you to keep trying harder. Avoiding unnecessary triggers and motivators. physical activity, such as vertical brisk movement. 1.Linda J. Vorvick (2013-08-29). “Nicotine and Tobacco”. Medline Plus. Retrieved 2015-05-21. 2. Introduction to Pharmacology Third Edition. Abingdon: CRC Press. 2007. pp. 222–223. ISBN 9781420047424. 3. Smoking and Tobacco Control Monograph No. 9″ (PDF). Retrieved2012-12-19. 5. Nicotine (PIM)”. Inchem.org. Retrieved 2012-12-19. Next articleThe Best Smartphone’s from China; is it Lenovo, Xiaomi or UMI?